Feeder is a full-featured application for creating, editing, and publishing RSS and iTunes podcast feeds. Features include quick and easy feed editing with auto-complete, templates, HTML tags, Markdown, an HTML preview and more. For podcasters there is drag-and-drop episode creation, automatic tagging of audio and video files with artwork, and an iTunes Store preview. Feeder can publish feed, images, and media files with FTP, SFTP, WebDAV, or Amazon S3, post to a blog when publishing, and announce new content on Twitter and Facebook once everything is online. Refreshed Design with new icons, preview and editing windows. Thumbnails and preview lines in the list. Integrated feed and settings views so the sidebar can be hidden. Share libraries with cloud services such as iCloud Drive, Dropbox, Google Drive and more. iTunes Podcasting updated for larger artwork and links in the iTunes summary. Markdown editing, converted to html in the feed. Autosave for edited items with windows restored on relaunch. Self-contained feeds with the content and settings for sharing with others. Search and replace all links in a feed. Fixed an issue where the sort pop-up would not be visible above the Items or Drafts views after switching to the Feed or Settings view. Fixed a crash that could occur when there is an issue publishing with standard FTP. Updated support for posting to Facebook. Next story Anamorphic Pro 1.2 – Edit iPhone Portrait Mode photos on your Mac. Previous story MacBooster 6.0.4 – Maintains and optimizes your system. Feeder 3.2.3 – Create, edit, and publish RSS feeds. 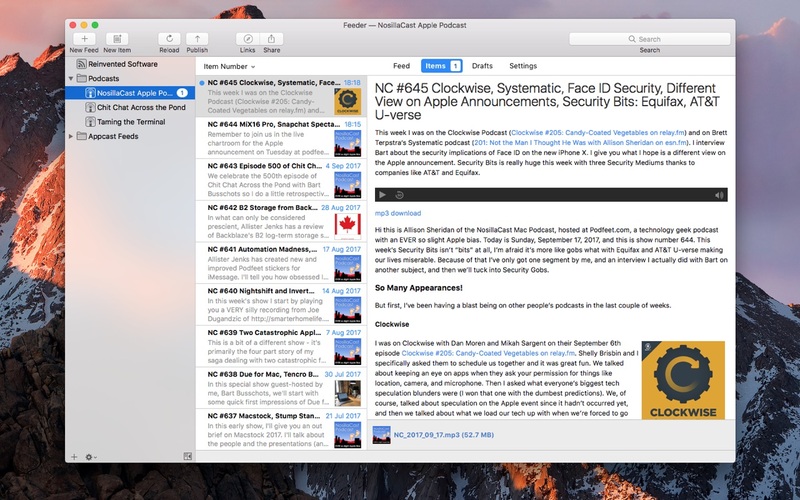 Feeder 3.1.5 – Create, edit, and publish RSS feeds.